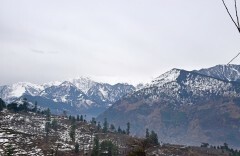 Go on a short and easy trek near Manali and explore the popular snowy mountains of Himachal. On a 4-day itinerary, you'll go hiking through the alpine forests near Manali and enjoy the sprawling cover of pristine, white snow. Have snowball fights, slide down mountain slopes and play with the snow to your heart's content. At night, you'll sleep in tents pitched near charming, hillside villages with views of tall mountain peaks on the horizon. This snow trek in Manali is perfect for families or groups of friends looking to get the essential experience of an easy, snow trek on a short itinerary. 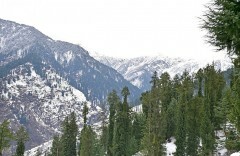 The unparalleled beauty of Manali's pine wood trees and gentle green hills is widely popular across travellers. In the months of winter, the pristine snow of the mountains turns the entire valley into a nature lover's paradise, giving a touch of serenity to the hill-station's already gorgeous forests. Snow capped peaks in the distance, the gushing cold rivers and alpine forests with cooing birds are a few attractions that winter travellers to Manali can't miss. 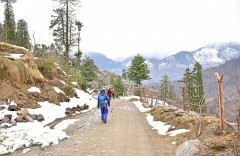 This snow trek in Manali combines this experience into a short and easy trek for everyone. 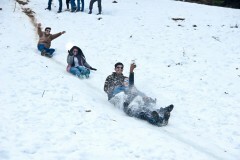 • Enjoy a snow-filled vacation in Manali. 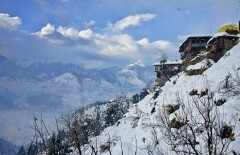 • Go on a short winter trek near Manali. • Get amazing views of snow-capped mountains. 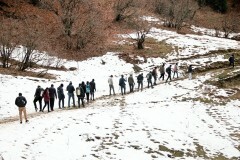 Travellers are required to follow instructions of the trek leader during the snow trek in Manali. 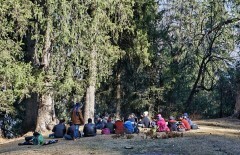 Consumption of alcohol, drugs and tobacco products like cigarettes is strictly prohibited during the snow trek in Manali. 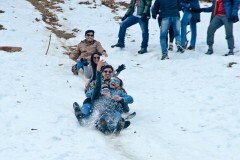 For cancellations made more than 20 days before departure date of the snow trek in Manali: 80% refund. For cancellations made 20 days or less before departure date of the snow trek in Manali: no refund. The tour operator reserves the right to alter or cancel the itinerary of this snow trek in Manali for the safety of travellers and staff. Unforeseen circumstances such as unpredictable weather conditions that result in a forced change in itinerary. Any costs arising due to such unforeseen circumstances are borne by the traveller. The tour operator takes utmost care to ensure safety of the travellers and shall not be held responsible for any accident or mishap during the snow trek in Manali. 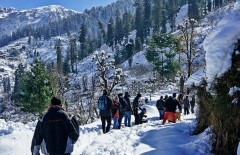 There is no pick-up for this snow trek in Manali. Report to the base camp in Naggar by 10:00 hrs. Today, you'll go for an acclimatization walk in the Naggar village and explore local attractions including the Naggar castle, the Gauri Shankar temple, the Tripura Sundari temple and the Nicholas Roerich art gallery. Spend the evening at the Naggar base camp with views of a beautiful sunset. Overnight in tents at the Naggar base camp. 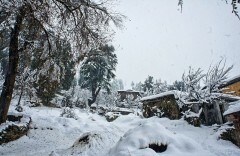 Explore the snow-ladden village of Naggar. Taking a small road carved into the mountain side, you'll trek from Naggar to the village of Rumsu. The path meanders along alpine forests that often see a sprawling cover of snow in the months of winter. After a short trek, you'll arrive at Rumsu and spend the afternoon at leisure. Alternatively, you can also head out to visit a few villages near Rumsu. Overnight in tents at Rumsu. Visit small and charming, hillside villages in the hills. Trek from Rumsu to the Sterling campsite over a steep trail that takes you deeper into the woods. The Sterling camp is pitched on dark green meadows amidst the alpine forests. The mountain slopes are often laden with inches of snow here, allowing you to have snowball fights and slide down snowfields to your heart's content. Overnight in tents at Sterling. 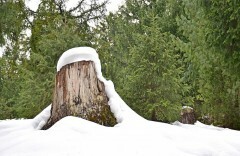 Sign up for a short and easy snow trek in Manali. Begin your descent back to Rumsu early in the day. 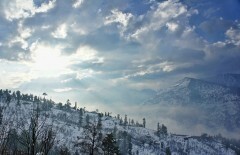 With morning views of the hills, you'll return to Rumsu and end your short snow trek in Manali. You'll leave for Manali in a private bus or similar vehicle and reach the city by 13:00 hrs. Your trip ends here. 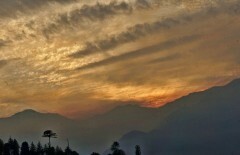 Click amazing photos of the sun rising over Manali's mountains. Overnight in tents at Naggar. Report to the Naggar base camp and go on an acclimatization walk. You'll be accommodated in tents at Naggar. Today's meal package includes lunch and dinner. All meals served include vegetarian dishes only. Trek from Naggar to Rumsu. You'll be accommodated in tents at Rumsu. You'll be given a sleeping bag for a restful night's sleep on all days. Today's meal package includes breakfast, lunch and dinner. Overnight in tents at Sterling camp. Trek from Rumsu to Sterling camp. You'll be accommodated in tents at Sterling camp. The campsite will be equipped with common kitchen/dining tent to serve and prepare meals as well as dry-pit style washroom tents. Today's meal package includes breakfast, lunch and dinner. Trek from Sterling camp to Rumsu and drive from Rumsu to Manali. 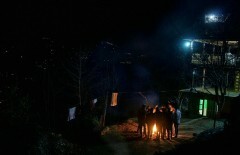 You'll be back in Manali by 13:00 hrs. Today's meal package includes breakfast only. 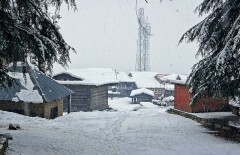 The Naggar base camp is accessible via road. You can take shared cabs from the Patlikuhal village to reach Naggar. 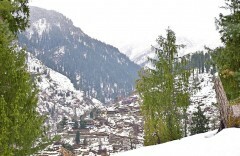 Patlikuhal is located 16-km/30-min drive from Manali. Local buses and taxis ply between Manali and Patlikuhal.